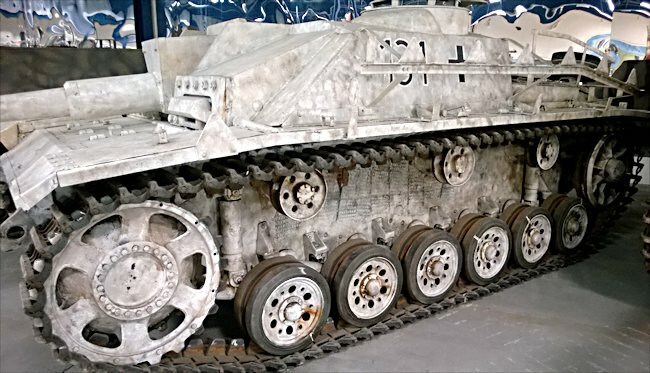 This German Sturmhaubitze StuH 42 L/28 Ausf. G 105mm Assault Gun (Sd.Kfz. 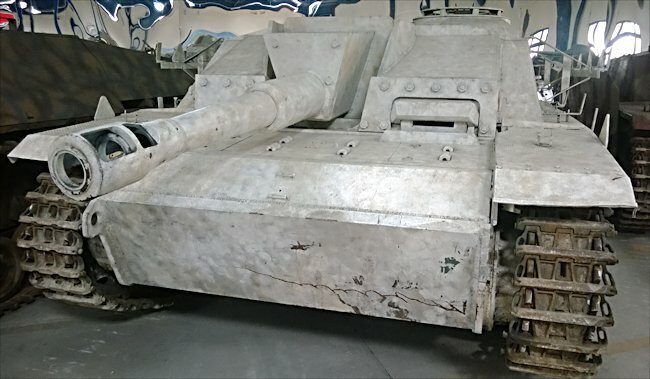 142/2) can be found at the French Tank Museum in Saumur in the Loire Valley. The Museum is called Musée des Blindés ou Association des Amis du Musée des Blindés, 1043, route de Fontevraud, 49400 Saumur, France www.museedesblindes.fr . The word Blindés means armoured. 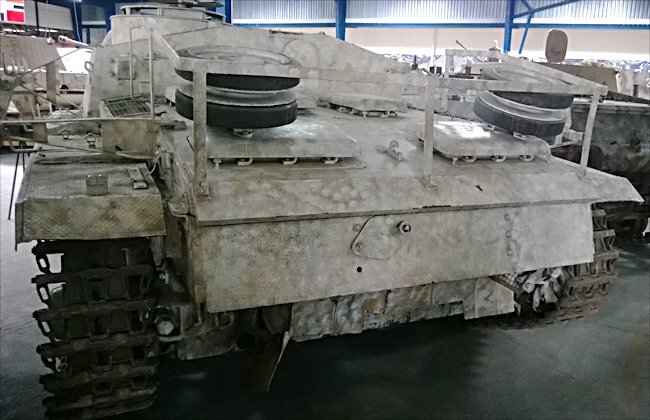 The Sturmhaubitze StuH was a varient of the very effective low profile Stug III 75mm tank destroyer. It was still based on the Paazer III tank chassis but a larger 105mm light howitzer 18M was added as an infantry close support weapon, a bunker buster. The Stug III was left to its anti-tank role firing armour piercing rounds leaving the StuH 105mm to fire HE high explosive rounds. The StuH was best used as a defensive weapon and the Stug III used in an offensive . As a trial the first nine 105mm guns were fitted in the chassie of a StuG III Ausf.E. They saw combat on the Eastern Front in Leningrad in November 1942 with the 3.Batterie/Sturmgeschütz-Abteilung 185 (third battery of assault gun detachment 185). Results were encouraging so a production target of 24 Sturmhaubitze StuH was started. These vehicles used the same chassis as the StuG III Ausf.G. Production started in March 1943 and over 204 had been built bu 1st January 1944. The StuH carried 36 rounds, normally a mix of high explosive and shaped charge rounds. It was also known as the Sturmgeschütz III für 10.5cm Stu.Haub.43 (Sd Kfz 142.2), the 10.5 Stumhaubitze 42 or the StuH42. In total 1,211 were produced. Production finished in February 1945. The StuH had a top speed of 40km/h and a range of 155km (95 miles). It hat 80mm of armour on the front of the tank but only 30mm on the sides and 50mm on the rear hull. Where can I find other preserved Sturmhaubitze 105mm?